Psychodrama provided the major impetus for Larry Winters’ recovery from PTSD. 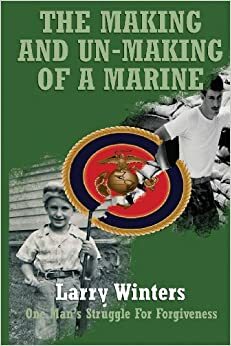 In The Making and Un-making of a Marine: One Man’s Struggle for Forgiveness (Millrock Writers Collective, 322 pp., $14.77, hardcover; $9.99, Kindle), Winters tells his life story, which was filled with anguish that began in childhood and continued into mid-life. His training at Parris Island answered that question. Many authors have described the punishing teaching methods used by boot camp instructors, but Winters offers a darker level of their physical cruelty than I had ever read. After AIT and metalsmith training, Winters spent nearly two years stateside in a Marine Air Wing before sailing to Vietnam on the U.S.S. New Orleans. Exposure to the negative feelings of Vietnam returnees at home disillusioned him about the war’s purpose. He decided to go AWOL, but a traffic accident ended the attempt. At Phu Bai and Marble Mountain, Winters joined what he calls the “dissident element.” He worked as a sheet metal repairman, spent three months on guard duty as punishment for the wrong attitude and misbehavior, and ended his tour as a CH-53 door gunner. He felt shame and guilt for serving in a war he did not believe in. Discharged upon his return home, he married his high school sweetheart. Their happy marriage failed under the pressure of Winters’ difficulties with running his own business and failing to bond with a son his wife and he had carefully and lovingly planned for. He felt rejected in all relationships: parents, wife, child, and employees. Divorced, he drifted from place to place and job to job. The book’s final section follows Winters (above) through his psychological rebirth. After he found Psychodrama, overcoming shame and guilt became his primary pursuit. Although taxing, the dynamic process of Psychodrama sessions shattered the emotional shield surrounding his PTSD. The sessions fascinated me because of what they forced Winters to reveal. Part of his rehabilitation included a fatiguing trip to Vietnam where his travel group of veterans confronted and reconciled with NVA generals and foot soldiers. Eventually, Winters solved his own problems, and went on become a mental health counselor. Originally published in 2007, the current book is a second edition. In a follow-on book, Live the Dream: No More Excuses, Winters explains his hard-learned strategies to gain financial freedom while maintaining balance between family, friends, and faith. This entry was posted in Electronic Book, Memoir, Nonfiction, Paperback, Post-traumatic Stress Disorder, Vietnam veterans, Vietnam War and tagged Larry Winters, Making and Un-Making of a Marine, Marine Corps Vietnam War memoir, Post-traumatic stress disorder, PTSD, Vietnam War, Vietnam War Marine memoir, Vietnam War memoir, Vietnam War post-traumatic stress disorder by vvaposted. Bookmark the permalink.